I chose to research glutamate because it is currently part of a study on epilepsy in a neuroscience lab I am currently working in. 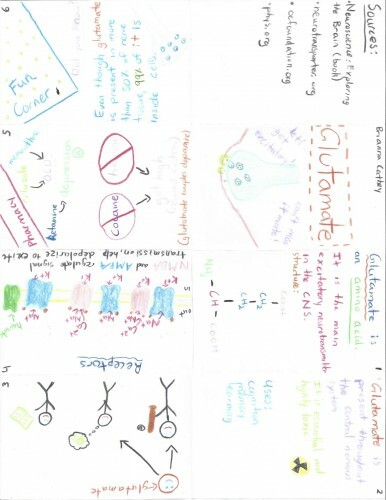 In the making of my flip book I tried to convey the importance of this neurotransmitter in cell communication, as it is present in nearly every cell. I attempted to use a cartoon-like style to present the information I found. I used a lot of different colors in order to make the information more organized and memorable. Also, I wanted to make the information visually appealing and make the reader sort of excited to read it. This entry was posted on Saturday, July 19th, 2014 at 2:45 am and is filed under Microzines. You can follow any responses to this entry through the RSS 2.0 feed. You can leave a response, or trackback from your own site. This was great. It was well drawn and nice to look at. Interesting how glutamate is highly toxic. I liked your drawings of the receptors that showed the movement of calcium, potassium, and sodium. Nice, I also really liked the drawings of the glutamate receptors. About toxicity of glutamate – too much or too little glutamate can be fatal to many neurons, they need to be exposed to glutamate within a specific range of its concentration to be happy (and alive). That’s why we can say it’s toxic, as Brianna said.